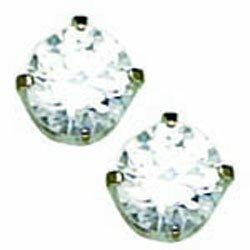 INVERNESS Medical Stainless Steel Basics 5mm CZ Piercing Earrings 181C by Inverness at Bijc. Hurry! Limited time offer. Offer valid only while supplies last. Thin posts and extra sharp points allow a painless passage through the ear and faster healing. Earring backs are 24K Gold Plate or Palladium Plate. Thin posts and extra sharp points allow a painless passage through the ear and faster healing. Earring backs are 24K Gold Plate or Palladium Plate. The Cassette contains two cartridges and hygienic cleansing towelettes. Cartridges fit into the piercing instrument and each contains one piercing earring and one earring back. Designed to allow the user to use one cartridge while protecting the sterility of the unused cartridge. If you have any questions about this product by Inverness, contact us by completing and submitting the form below. If you are looking for a specif part number, please include it with your message.